Although most of us are probably enjoying the mostly snow free winter so far, the children at My World of Learning are hoping for some today! 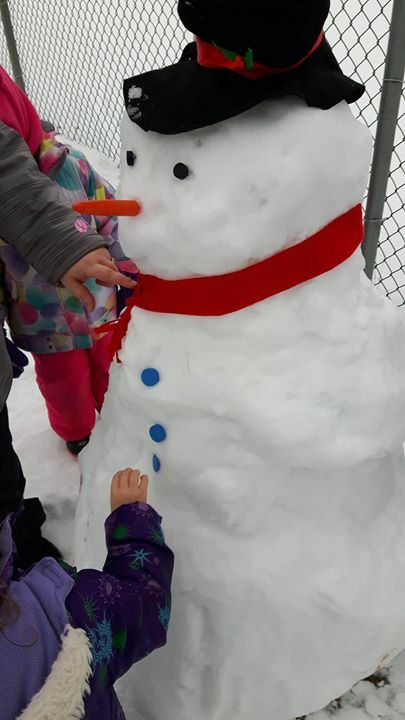 It has been a few weeks since they created this snowman and are looking forward to playing in the snow again. Happy Birthday Ketrina! Wishing you a very Happy day from all of us at My World of Learning! We were a lucky group this morning at My World of Learning to have the Amazing Mr. J entertain us! Thank you to Mr. J and one of our families who arranged for his show to come to the centre in honour of their daughter's birthday. We all loved the show! Happy Birthday Holly Fleming! Holly teaches in the senior preschool classrooms and holds a management position. Enjoy your birthday weekend! Santa visited the centre this morning and the children sang a few songs for him. While Santa passed out books from the centre, each child had their picture taken with the jolly fellow. From all of us at My World of Learning, we wish you Happy Holidays!